New loan signing Matthew Upson is confident Brighton can reach this season's Championship play-offs despite experiencing defeat on his debut. The Seagulls went down 3-1 to Sheffield Wednesday on Saturday in a controversial match at Hillsborough. 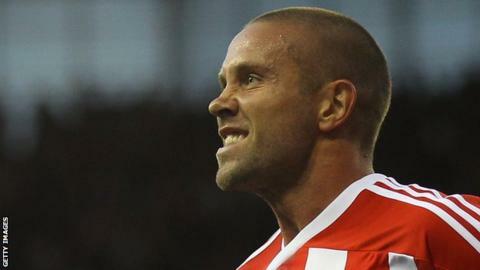 But Upson, who moved from Stoke City late on Thursday, told BBC Sussex he had seen enough to know he had made the right decision. "There's everything to play for over the last 17 games," he said. Brighton were reduced to 10 men shortly after the half hour when Ashley Barnes was sent off for serious foul play. "It was always going to be a difficult away game, and going down [to 10 men] so early didn't help, but I thought we stuck in there and made the best of a difficult situation," said Upson. "At half-time the manager shook it up and tried to make us as dangerous as we could be to score a goal and I thought in the second half we did extremely well, we put them under pressure, we kept the ball, scored a good goal and had numerous chances to go 2-2. "At that time I thought we had the ascendancy and maybe could have taken something from the game, it was just a shame we threw it away by conceding a poor third goal." The result leaves Brighton eighth in the Championship, five points off a play-off position. And Upson admitted he was looking forward to having a full week's training with his new team-mates before the Seagulls welcome promotion candidates Hull City to the Amex Stadium on Saturday. "I trained at Stoke on Thursday morning, travelled down to Brighton later in the day, and trained and travelled back up to Sheffield on Friday to play on Saturday, so it was a crazy 48 hours. "I think when you watch the Albion play they play some really good football and that really interested me. They have some fantastic players, really good technical players, and are in a league position where we can push for a play-off place - there's everything to play for over the last 17 games." The 33-year-old centre-half said he had not hesitated to move from the Premier League into the Championship. "It's more important than anything to me to play, I don't want to sit around in the remaining few years of my career not doing anything, I want to be involved and in the thick of it and hopefully I'll get that opportunity here. "It was nice to get 90 minutes into my body, which I haven't had for a while. Seeing the Amex on Thursday was fabulous, I didn't realise Brighton was such a big club to be honest, and the away support we had at Sheffield was excellent - it's really surprised me."